As a whole, I decided to skip St. Paddy’s Day this year. It’s not that I would normally do big St Patrick’s Day crafts or decorations, but I normally like to put together fun cards or printables or maybe a little gift for co-workers or nieces. For some reason, though, I just wasn’t feeling it this year. Maybe I was having a premonition and sensed that my husband was going to have an emergency appendectomy a week before – either way, I’m thankful I didn’t have anything planned for the holiday. I did make this fun St. Patrick’s Day craft though for my husband’s office. We are both Irish and German (with a couple other things thrown in there). His family is very vocal about being Irish, so I thought I would make a small shamrock craft that he could keep at his desk. It was just something cute to give him that I thought would make him chuckle, but he ended up really liking this Shamrock block. I started with a naked 2″ wood block and painted it white with 2-3 coats. 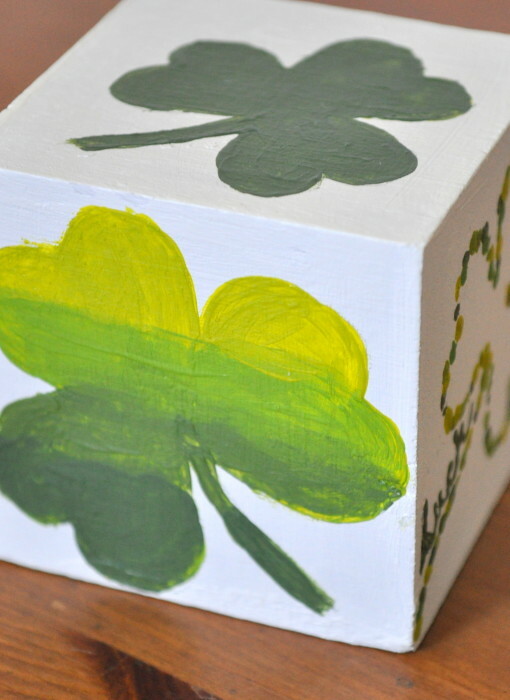 Dark Green Shamrock: For this side, I used a shamrock stencil with the shamrock cut out and a sponge with dark green paint. This is the most basic of the shamrocks I applied. 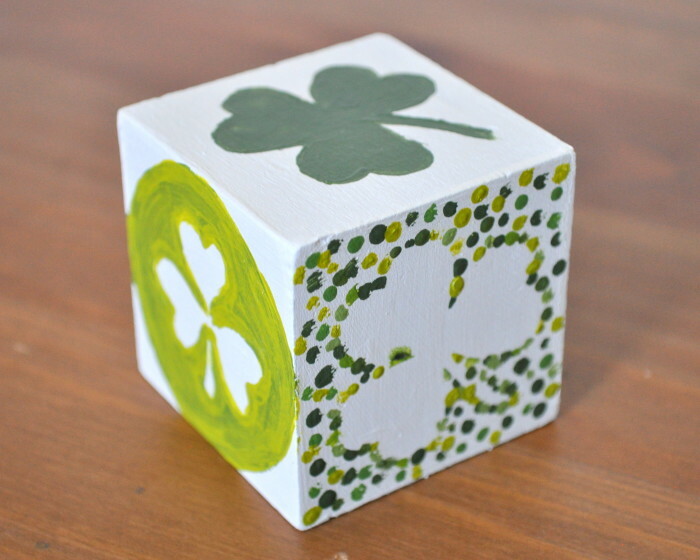 “Luck” Dotted Shamrock: I had a few shades of green that I was using for the block. 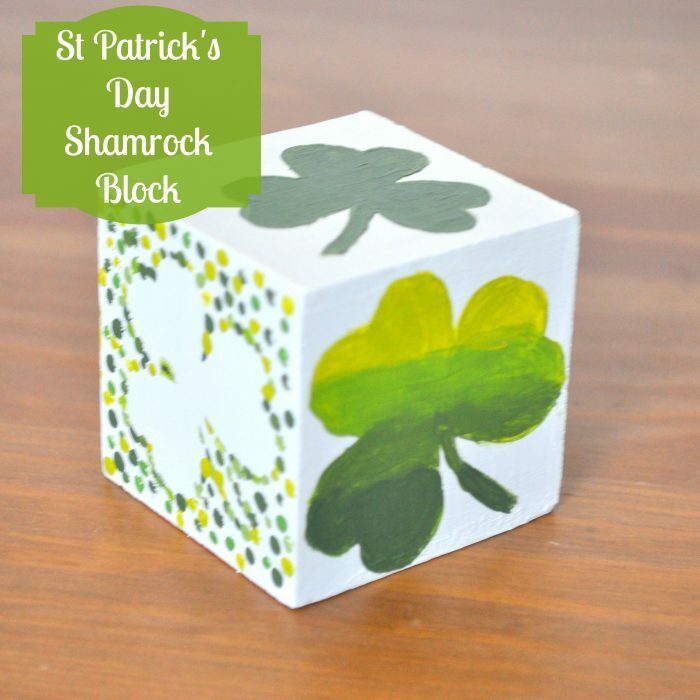 I put a shamrock cutout down in the middle of the block and made dots around the edge. Once I had filled in most of the outline with dots, I removed the shamrock and filled in where necessary. 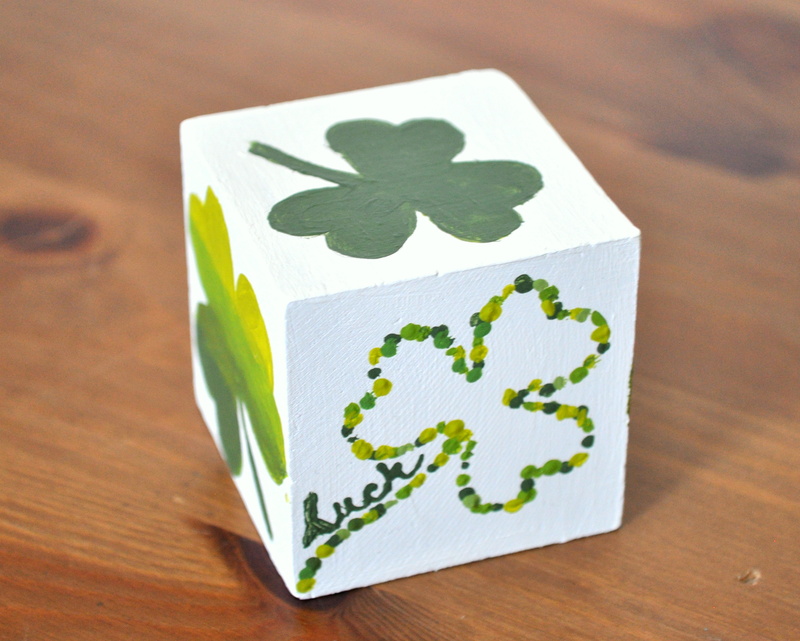 Then, using a thin paint brush, I painted “luck” along the stem I decided to extend to the edge of the block. 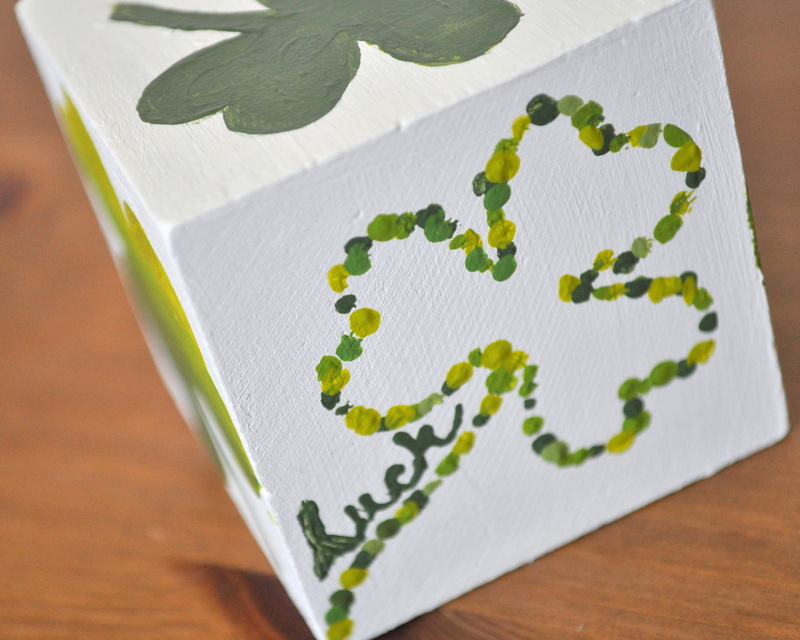 Ombre Shamrock: I used a shamrock stencil with the shamrock cut out for this one. Then, I started at the top with a lighter color and worked my way down, letting it try between coats. I used a brush for this, which worked fine, but I would have preferred using my small sponge to dab on the paint if I had been able to find it. After all the colors are applied, work on blending the colors as needed. For this step, adding a very small amount at a time is best. Outside Dotted Shamrock: Again, I put down the shamrock in the middle. I made dots around the edge and removed the shamrock when I thought it was pretty well filled in. Then, add dots to the border where necessary. After that, I just randomly added dots around the outside of the border to fill it in. Shamrock Circle: I cut out one of the shamrocks with a circle around it on the stencils. So I put down the shamrock cut out in the middle and then the larger outside circle as well – which left an outline of the shamrock to fill in. For this, I started with a dark color and then added a thinner, lighter layer on top to give the color some depth.